Made another variation of raw vegan borscht today – raw vegan Beetroot Soup! So in love with these soups. Interestingly, I was never a big fan of cold vegetable soups before, in fact I actively disliked them. But this drastically changed once I fully adopted a raw vegan diet. 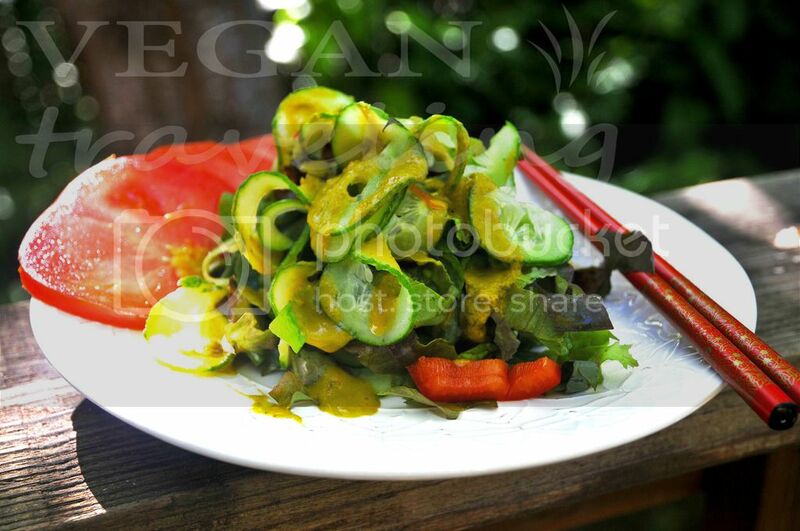 Now, raw vegan soups are a huge part of my recipes, especially in the summer. These soups are bright, light, full of vibrant flavour and vitamins, and overall amazing for you health! I’ve been also very fond of beets for quite some time now, first in juices, and now in soups. Not only they provide an absolutely amazing rich pink color, they’re also packed with vitamins, minerals and antioxidants. So eating your beets at least weekly would be a great thing for improving and maintaining your health! Wash and peel carrot and beetroot. Grate half of the carrot and beetroot and place the other halves into your Vitamix or blender of choice. Add 1/2 orange, grapeseed oil, apple cider vinegar, salt, garlic and water to the blender. Blend on high speed until you get a smooth raw vegan broth. 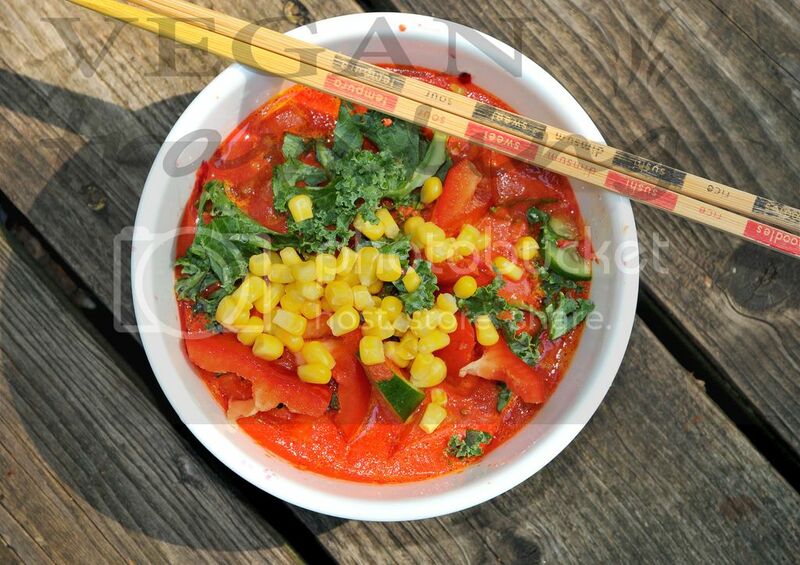 Pour the broth into a bowl and top with chopped green kale, corn, cucumber and red bell pepper. Summer is in full swing! It’s definitely going to be an amazing hot weekend in Seattle, so we’re gonna to hit the Alki beach today and of course shop at farmers market tomorrow. Pure bliss 🙂 And for now, enjoying this amazing invigorating and cooling summery Kale Pineapple Raspberry smoothie. On such hot days it’s very important to remember to stay well hydrated. Make sure to drink a lemon water or fruit infused water in the morning, and bring fresh filtered water with you everywhere you go. If you don’t feel hungry on such days, consider doing mono-meals or a juice/smoothie day – this will ease the heat off you and provide additional detox for you body. 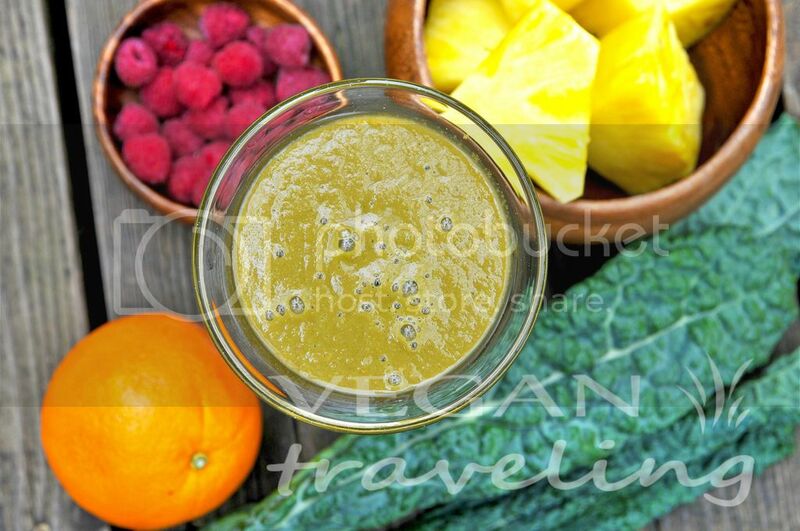 Check out my recommendations for going on a juice cleanse to make sure you do it properly. Wash, peel and cube all ingredients. Place everything in your Vitamix or blender of choice and mix on high speed. I discovered this salad when happily foraging in Whole Foods salad bar and absolutely adored it! Obviously I had to make my own raw vegan version as soon as I got home. 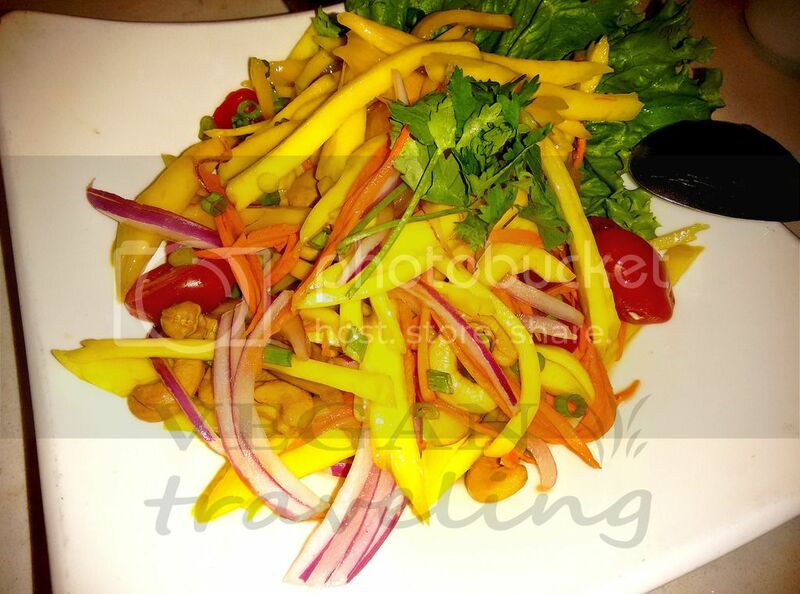 This salad is a fantastic blend of sweet, sour and slightly spicy flavours. It’s vibrant in colors and packed with fiber and vitamins! Wash and peel beet and carrot, then grate them. Add all the other ingredients and mix well. 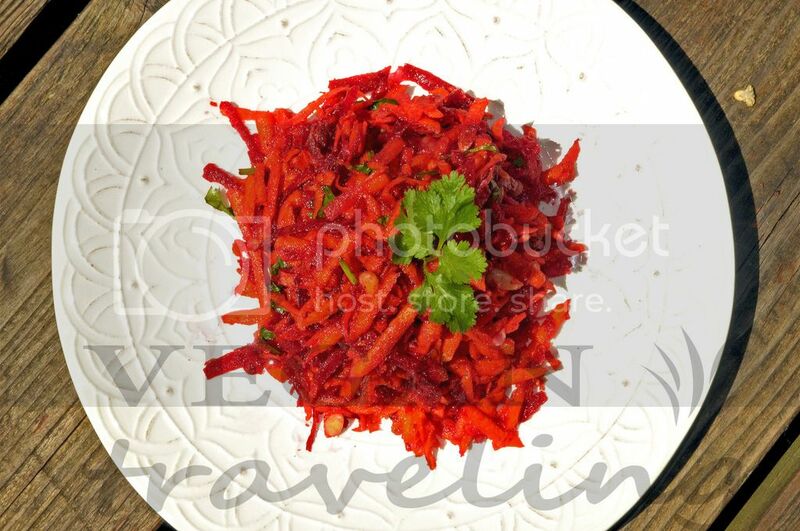 Let sit in the fridge for 1-3 hours before serving for the beet and carrot to absorb the spices and lemon juice. Felt like something spicy today and after some thinking came up with this dressing! Wash all ingredients. Spiralize the cucumber – I used my Tri-Blade Vegetable Spiralizer. 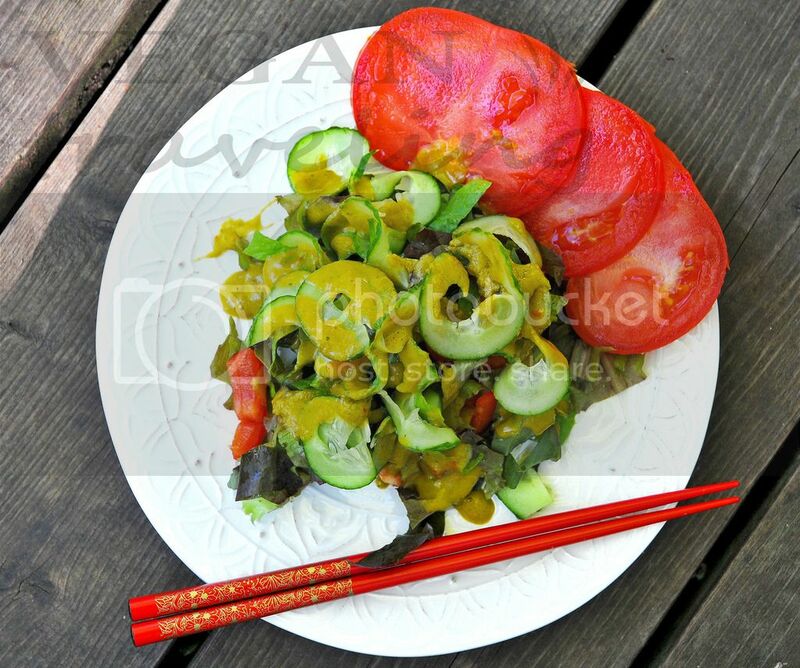 Chop lettuce, slice tomatoes and red bell pepper. Chop scallions finely. Mix everything. I’m so in love with the texture of spiralized veggies from yesterday, that I made a salad with them again today. 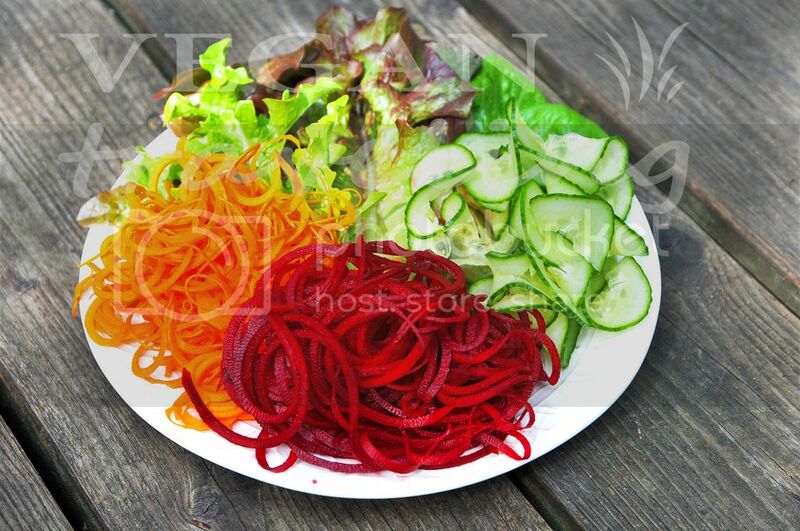 Spiralized beets, carrots and cucumber mixed with vine tomatoes, my lettuce from the garden and pumpkin seeds. 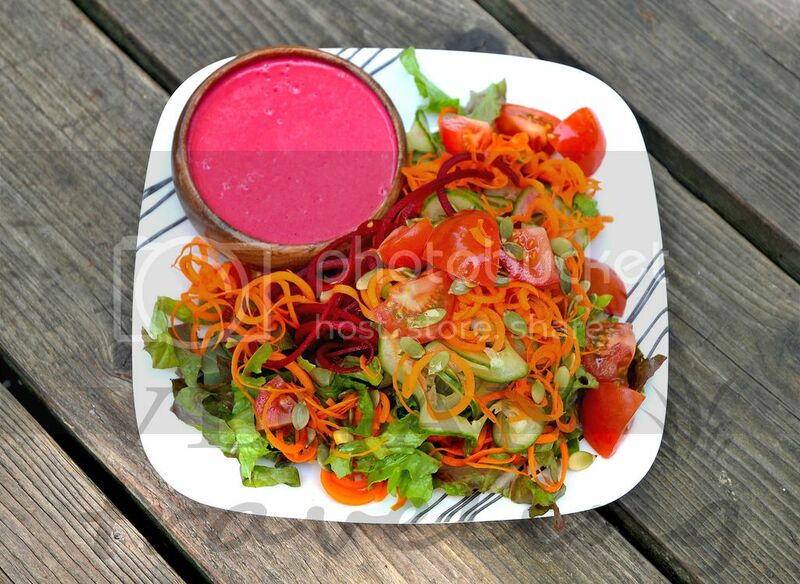 And all dressed with this beautiful pink Orange Beet Dressing…scroll down for the recipe. 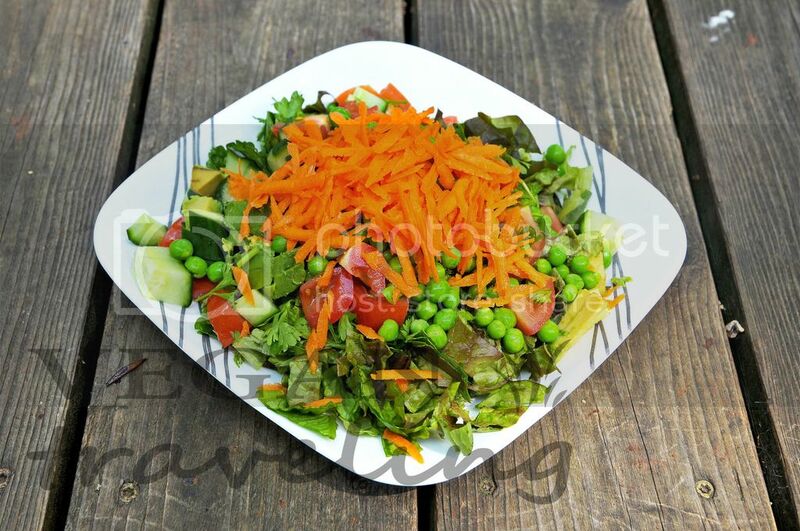 I feel so happy just looking at this salad, and so grateful I eat things so colorful and full of vitamins and nutrients, while absolutely cruelty-free! 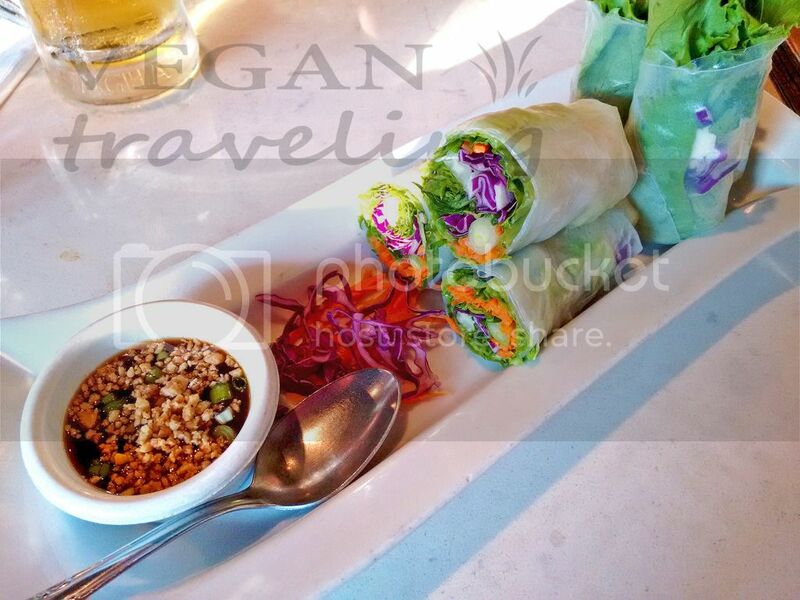 Who said raw vegan lifestyle is hard to maintain? Bought a whole bunch of radishes and baby spinach at the market, so decided to make a veggie mosaic salad today that involves those two. Dehydrate corn in hot water. Mash avocado, half cherry tomatoes. Mix avocado, tomatoes, garlic, olive oil, hemp seeds, salt. 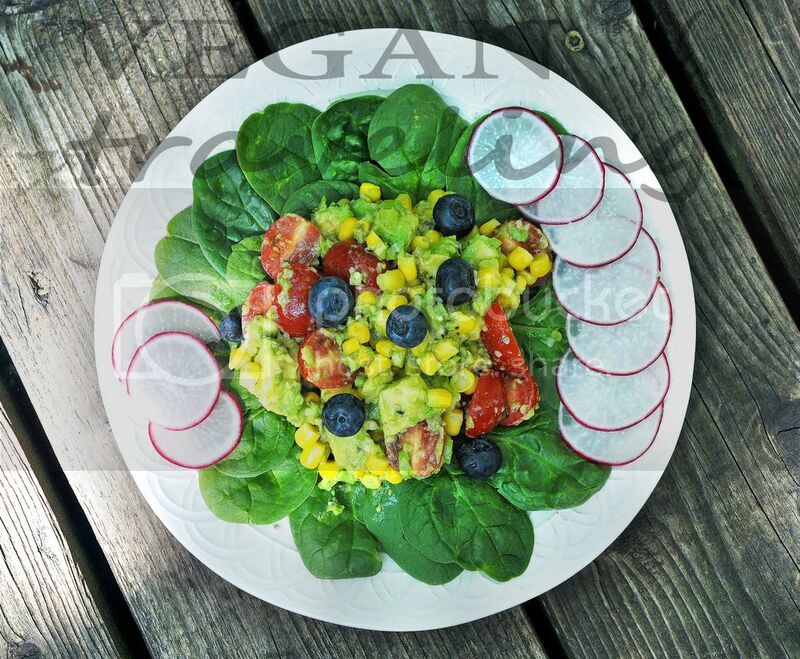 Serve the salad on a bed of baby lettuce, decorated with radish and blueberries! Chop the lettuce, parsley and chives. Dice tomatoes and cucumbers, mash avocado, shred carrot. 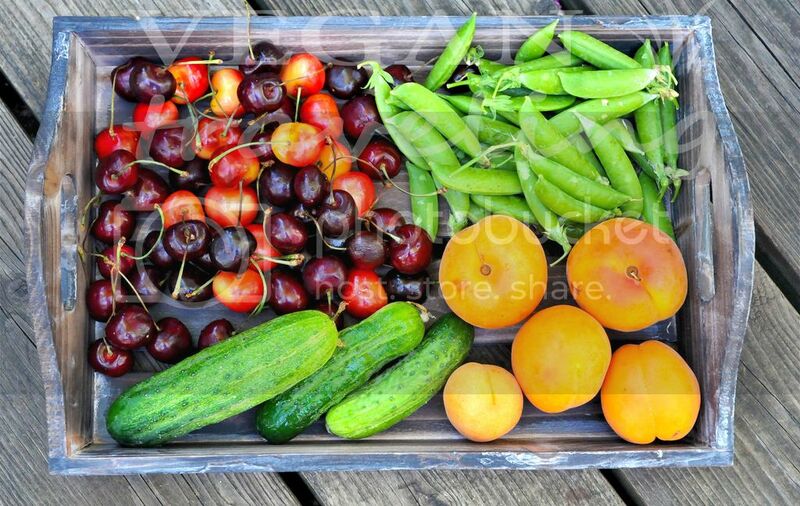 Then layer all veggies on a plate in the same order. Dress with grapeseed oil, lemon juice, salt.